On September 24, 2015, Ben Damon was a passenger in his friend’s car as they began a one hour drive from Fryeburg to Portland, Maine. Not long after they started the vehicle struck a moose, compressing the roof of the car by over a foot. With Damon being 6-foot-6, and the compressing of the roof, it led to him breaking his fifth and sixth vertebra. With the use of the Jaws of Life, he was removed from the car and quickly life-flighted to Central Maine Medical Center. The doctors quickly came to the conclusion after x-rays there was little or no hope that he would ever regain his mobility, and he be a quadriplegic. Ben and his family have faced the situation head-on. After spending over a month in the ICU in Maine, he was transferred to Spaulding Rehabilitation Hospital. It was there that he had a chance to meet Travis Roy. Roy has learned that you can’t go in and tell the SCI survivor that everything is going to be all right, because they are not ready to hear that so soon after the injury. He says believes there needs to be a period for mourning the losses, then a few months down the road it’s important to turn the corner and move on. It is then that Roy prefers to go to the hospital and show by example that things will work out. Ben Damon and his parents with Travis and Lee Roy at the 2016 Merlino’s Golf Tournament. 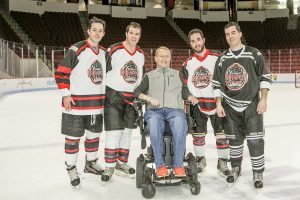 During the spring 2016, Travis visited with Ben at both Spaulding and during his time at New England Rehab, and has formed a friendship with Damon and his family. 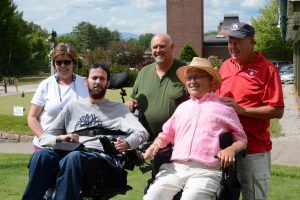 Damon came to North Conway, N.H. in June for the Merlino’s Golf Tournament that benefits the Travis Roy Foundation. The Travis Roy Foundation provided Damon with a financial grant to purchase a special medical bed and a ceiling lift to help transfer him from his bed to his wheelchair. Ben Damon is a perfect example of why the Travis Roy Foundation is needed. The transition from able-bodied to paralyzed is devastating, but with good family, friends, and the appropriate adaptive equipment, life can be very much worth living. At the same time, hope for a breakthrough in research is critical to maintaining a positive attitude when dealing with paralysis. 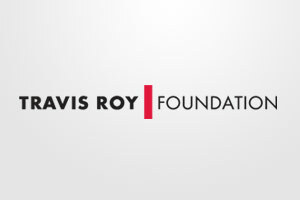 Through the research funded by the Travis Roy Foundation, this helps to make “hope” a little more tangible.